Avalon Quilters 2016 Raffle Quilt: "Ladies Leaping at the Zebra Crossing"
The cooling rooms on a hot day of the Avalon Uniting Church in Bellevue Avenue Avalon will again play host to the 2016 Exhibition of Works by Avalon Quilters members. The 2016 Show is open Friday March 11th from 9 a.m.to 7 p.m. and Saturday March 12th from 9 a.m. to 5 p.m. - $5.00 Entrance fee. 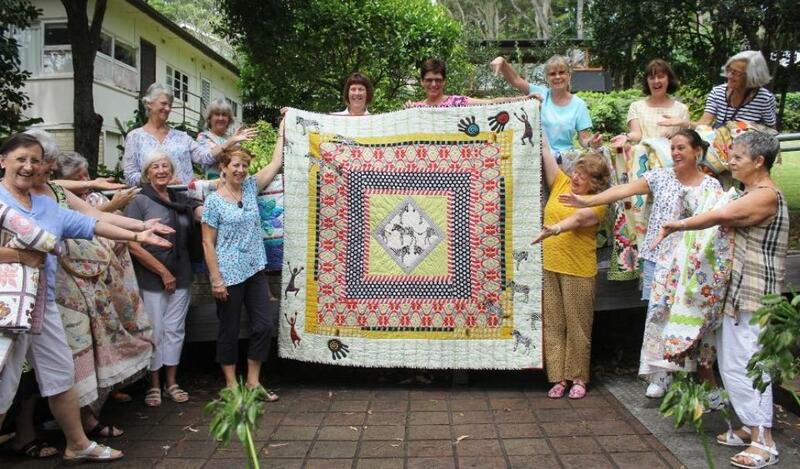 This year's Raffle Quilt, called "Ladies Leaping at the Zebra Crossing" has been made by members Judy and Jane. Judy brought along the centre piece and Jane completed and added all the 'bits and peices' after a 'Quilters discussion' - imagine the girls standing around the fledgling quilt, one hand on hips, cup of tea in other hand, amiably discussing ideas. Apparently the border came off once, then another was put back on and the whole took just over four months to complete. Avalon Quilters donate all funds raised through their Exhibitions of Members Works to the Australian Mitochondrial Foundation their elected charity, and have raised well over $20 000.00 for the vital work this foundation pursues each year. Besides the wonderful quilts that will be on display this year a table of very high quality handmade items will be on sale, pin cushions, baby bibs, bags etc. There will be a few quilts for sale but most take many months, if not years, to complete and are made by members to keep or give as lifelong and generational gifts for their family members. Considering handmade quilts made today sell for hundreds of dollars, and this doesn't go anywhere near the cost of specialist antique fabrics, stitches used and time put into these works of art, you may understand why most are not for sale. Apparently the most expensive quilt ever sold was an American Civil War-era quilt known as the Reconciliation Quilt, named for its depictions and references to post Civil war scenes. At a Sotheby's auction of 1991 $264,000 was paid for it by a couple who collected quilts and later donated it to the International Quilt Study Center and Museum at the University of Nebraska. This quilt was made in 1867 by Lucinda Ward Honstain of Brooklyn, New York. The quilt was on display in New York in 2014 as part of the New York Historical Society's Homefront & Battlefield: Quilts & Context in the Civil War Exhibition, organized by the American Textile History Museum, as part of the 150th anniversary of the Civil War. Seeing the beautiful works Avalon Quilters have finished each year forms part of the Pittwater calendar of do not miss events and many travel a fair way to see this annual celebration of an ancient and practical artform. There too traditional fabrics and methods are employed to make something wonderful in each case and many of the quilters can tell you about templates, fabrics and methods. Tickets for the 2016 Raffle Quilt may now be purchased at Avalon Fabrics in the arcade that runs besides Amber waves bakery, and some may be left for sale at the 2016 Exhibition. Raffle tickets are $5.00 as well. 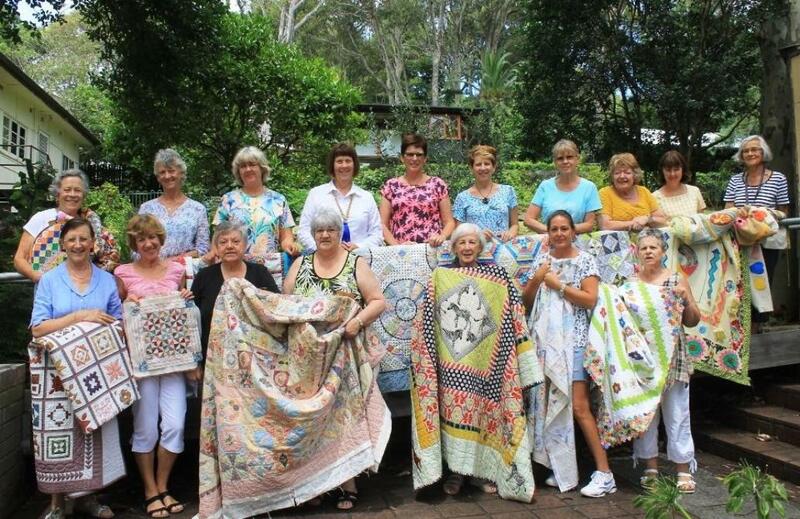 Avalon Quilters Members with their almost complete 2016 works. Avalon Quilters 2016 Members Exhibition - A J Guesdon, 2016.